Cookie lovers, put your New Year's resolutions on hold and get ready to rip into a box of something comforting. The Girl Scout cookie sale is here, and $3.50 will buy you a box of the chocolate-covered minty-ness that is the glory of the Thin Mint. Boxes and boxes of cookies will take you back to the first time you pulled back the wrapper and bit into the salty, sweet Carmel Delite. We were there on Friday as the first boxes of cookies were pulled from a bakery truck and loaded into a super-secret location in Fort Worth. Cookie lovers, get ready: the Girl Scout Cookie Sale is here! This year, there is a new flavor and a packaging surprise from the Fort Worth-based Texas Oklahoma Plains Council. Scout Emily Treacy had all the details memorized on the latest addition. "The new cookie is the Shout Out," she said. "It tastes more like a British cookie that you'd have with your tea or coffee." Think shortbread meets gingerbread. We're sold. The council also has another change this year. Thanks-a-Lot cookies have eco-friendly packaging. Kathleen Copeland, the editor-in-chief for the Texas Oklahoma Plains Council, said the new look means less waste for landfills. It also takes up less room on the trucks, so it's a fuel saver. 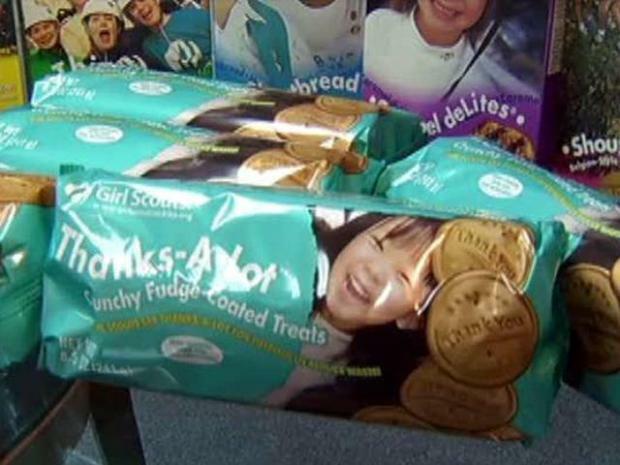 The Girl Scouts hope to expand the packaging next year if the experiment works well. Yummy deliciousness aside, the cookie sale isn't just a fundraiser. This year, the scouts will learn lessons about the environment, salesmanship and change. "Even a 5-year-old Daisy Scout can make a difference in this world," Copeland said. The Texas Oklahoma Plains Council and the Dallas-based North East Texas Council both began sales Friday. But the North East Texas Council does not have the new packaging.